Georgette Kanach’s design was recently chosen to adorn the coin as well as a plaque that will hang in the Hall of Flags in the state capitol. There are four other veteran recognition plaques hanging in the capitol that represent veterans who served in World War II, Korea and Vietnam, as well as women veterans. A likeness of each plaque is made into coins and presented to Maine veterans based on their era of service. Kanach is a self-taught artist who works with scrimshaw, wood burning and airbrushing, among other media. She was inspired to enter the contest because of her family history in the military. Both of her daughters, two grandchildren, three of her brothers and many nieces and nephews either are veterans or continue to serve in the military. Kanach began by doing extensive research on coins and how they’re made and on the four plaques at the capitol. Designing the coin on the computer was a “kind of art (that) was new for me. It’s not a hand-drawn thing,” she explained. Another challenge was the fact that the plaque had to encompass both sides of the coin. She made a list of all the elements she wanted to include and discussed multiple concepts with one of her daughters. The Veterans’ Bureau requested some changes to her design, which she completed, and then she resubmitted her design. Maine veterans were invited to vote on the two finalists online, and 1,2000 ballots were cast. The formal unveiling ceremony has yet to be announced. 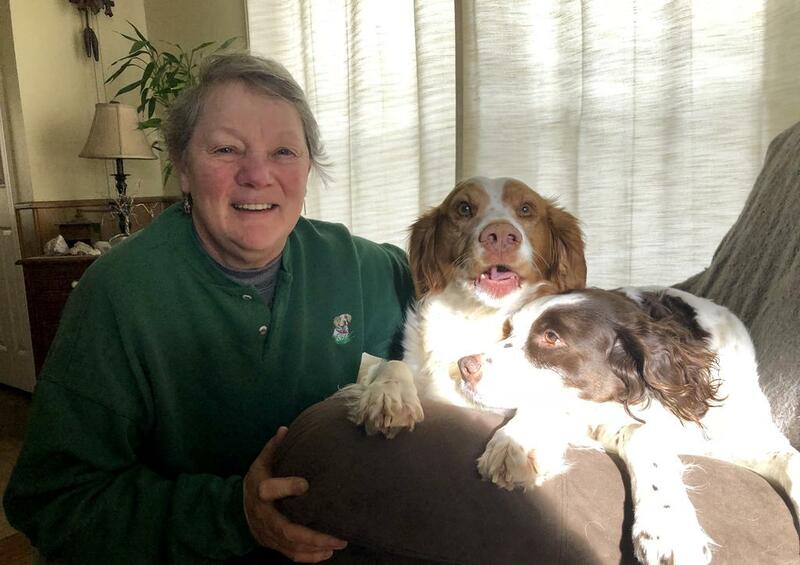 Georgette Kanach with her dogs Molly and Star.